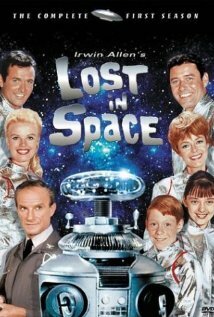 For those of you too young (or were unborn like me then) to remember, Lost in Space was a reeking bucket of kiddie TV bait perpetrated by one Irwin Allen - TV producer, director of disaster movies, and nerf brain that aired between 1965 and 1968. The TV series was actually a sci-fi adaptation of the Johann David Wyss novel The Swiss Family Robinson. Its premise was that NASA had built a spaceship capable of reaching a nearby star, and to man the first expedition it chose an all-American family - one that demonstrated no observable skills, training, or intelligence. As expected in a plot of this kind, their flight is thrown off course by Dr. Smith - stowaway, saboteur, and flaming queen. They crash-land on a planet of cardboard boulders, where they encounter a nonstop parade of ludicrous aliens, and where they accept Dr. Smith into their family, despite the fact that he tries to kill them all on a weekly basis. Despite the cheesy nature of the whole affair, I got sucked into it when a friend loaned me an DVD set of the entire 3 series. Watching it reminded me when I was young and crazy about spaceships, robots and laser guns. The first series is lotsa fun but somewhere in the second series, you get the feeling that somebody is yanking your chain, as the plot gets crazier and preposterous. Amazingly, I don't think this show was supposed to be a comedy. At least not at first. Eventually, those helming the series went with the flow and let it slide deeper into dopiness, and today the show has definite camp value. For those who cant lay their hands on the TV series, you can watch the 1998, Stephen Hopkins directed big budget remake instead- with the same title Lost in Space. New Line Cinema apparently put a lot of eggs into this basket, giving it a reported budget of $80 million and a premium cast that includes William Hurt, Mimi Rogers, Matt LeBlanc, Heather Graham and Gary Oldman. In spite of being a OK box office success, you'll be judging if its a sci-fi action movie for laughs or a sci-fi life in peril drama you are watching. C'mon, the family-in-space idea is just too absurd to base a drama on. No matter how you snazz it up with top-drawer actors, expensive sets, and digital effects, the premise will and is still galactically stupid. Anyway, I don't think many of us have better ways of waste our time so grab a popcorn, switch off your convictions and enjoy the show. 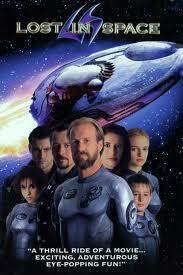 No matter whether you watch the TV series or the Movie remake, its one hell of a campy sci-fi fun!